Here’s another amazing time-lapse video we’d like to recommend for your selected viewing. Shot by photographer Brad Goldpaint, the video, which he titled Breaking Point, shows a stunning panoramic view of the night sky with stars wheeling. What makes it really amazing is the manner in which it’s been made, as Goldpaint used a technique he calls Delineated. 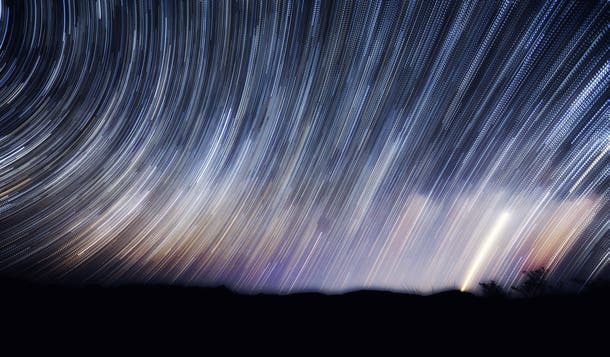 Thus, the wheeling star effect that gives perspective to the other’s relative motion along its axis is not the result of a single exposure, instead its comprised of 60 short exposures, or 60 points which make up the star lines. Besides this beautiful effect, in the video you’ll also able to notice the Milky Way’s glow and even Venus (the brightest point in the shot). Check out the HD version on Vimeo for the best experience.